Dahak's pad is the worse for wear at the end of THE DELIVERER. Story-writing has been a strength of Xena: Warrior Princess (XWP) since its debut, indeed, since the character of Xena first appeared in the Hercules: The Legendary Journeys (HTLJ) episode, THE WARRIOR PRINCESS (H09/109). Imaginative scripts and fully-formed characters were hallmarks of the first and second seasons, no doubt contributing to the show's popularity. In the third season, though, the series stumbled, hampered by poorly-written scripts, often unclear plots, shallow characterizations, and inconsistencies both within episodes and with the overall series to date. These problems were most evident in the season-spanning story arc involving the demon-god, Dahak, and his evil progeny, Hope. This arc also extended into HTLJ, in the two-part episode ARMAGEDDON NOW (H72,73/413,414). Azi Dahaka (The Lie): see Angra Mainyu. Hell is the abode of the Lie, and the Lie is a synonym for evil. It is that which should not be. Azi Dahaka is the personification of the Lie, often depicted in mythology as a terrible dragon with three heads, six eyes, and three jaws, whose body is full of khrafstras (evil spirits or beings). Dahak would seem an appropriate being to introduce to the collective Hercules - Xena universe, where the struggle of good against evil is an integral part of almost every episode on both series. Unfortunately, the translation of Dahak from Zoroastrian mythology to the world inhabited by Xena, Hercules, and their collective group of friends and foes left something to be desired. This article will discuss the problems that affected XWP's third season, with particular attention to the Dahak arc stories. This article will also compare the writing in XWP's third season to the writing in three other television series: Hercules: The Legendary Journeys , The X-Files , and Buffy the Vampire Slayer . Some fans were disappointed when Caesar disappeared from THE DELIVERER. The teaser for THE DELIVERER (50/304) would have viewers believe this episode involves a rematch between Xena and Julius Caesar. Xena travels with Gabrielle to Britannia to assist the warrior Boadicea and her army against the invading Romans. The episode builds toward an epic clash on the battlefield. However, thunderclouds over a nearby temple alert Xena to a more ominous danger. Arriving in the temple, she realizes that the 'one god' worshiped by the priest Khrafstar and his followers is in fact a demon-god called Dahak. Xena fights and defeats Khrafstar, then destroys the temple. The battle between the Romans and the Britons is completely abandoned, leaving the audience to simply guess what happened. This awkward jump from battlefield to temple suggests that an entire episode's worth of material was cut from the final product. THE DELIVERER (50/304) would have worked far better as two stories: one dealing with Caesar and Boadicea, and the second dealing with Khrafstar and Dahak. Caesar himself actually appears on-screen for barely five minutes in the episode. Karl Urban, the actor playing Caesar, is not even listed in the opening credits. THE DELIVERER (50/304) is not a story about Caesar. Caesar is simply a red herring to make the introduction of Dahak seem more of a 'surprise'. This unfortunate plot device cheapens one of the finest villains on XWP. Earlier, in DESTINY (36/212), Caesar is depicted as supremely confident, arrogant, and brutally indifferent to human life. Viewers see in THE DEBT (52,53/306,307) the horrific impact - physical and psychological - that Caesar had on Xena's life. In effect, he created the "Destroyer of Nations", the Xena who spent ten years on a rampage of bloodshed and destruction. Surely their rematch deserved to be more than a mere glare across the battlefield! Another incongruity in THE DELIVERER (50/304): Caesar remembers Xena and seemingly knows everything about her. It is hard to believe that Caesar would even recognize the woman he dismisses in DESTINY (36/212) as a barbarian, someone to be tricked, conquered, and executed as an example to his enemies. But on XWP, the entire world revolves around Xena, and every character in it is obsessed with her. This narrow focus is patently ridiculous. If Caesar is treated badly in THE DELIVERER (50/304), Ares fares worse. The war god appears in this story, but mostly as window-dressing. He knows the potential danger of Dahak, yet does nothing to thwart the demon's plans. He will not destroy Dahak's temple, although he could quite easily, and, furthermore, why he does not is never made clear. Ares does not give Xena any solid information that, at the very least, might have prevented her from leaving Gabrielle in the temple. Ares only tells her that this one god, who Xena believes to be the god of the Israelites, is evil, and that his temple should be destroyed. Xena has no cause to believe Ares and evidently feels he is trying to eliminate a rival religion. If Ares had a reason for not giving Xena more information about Dahak, it is never made explicit, either in THE DELIVERER , or elsewhere in the third season. Perhaps the greatest wasted potential in THE DELIVERER (50/304) is Gabrielle's loss of blood innocence. Until this story, the young woman had deliberately refrained from taking life. She would not even kill Callisto to avenge the death of her husband, Perdicas [ RETURN OF CALLISTO (29/205)]. Yet in THE DELIVERER , she seems willing to commit murder in order to defend a man she barely knows. Gabrielle's loss of blood innocence would have been more powerful had she killed, for example, to save Xena's life or the life of someone in her family. But like Xena's rematch with Caesar, everything in this episode is contorted to underscore the arrival of Dahak. Finally, the near-crucifixion of Gabrielle is completely gratuitous because it does little to advance the plot. This melodramatic scene further cheapens the impact of DESTINY (36/212). Rosemary -- I mean Gabby -- gives birth to Dahak's daughter in GABRIELLE'S HOPE. GABRIELLE'S HOPE (51/305) is a sequel to THE DELIVERER (50/304). After being suspended in a stream of fire over the demon's altar, a horrified Gabrielle discovers that she is pregnant. The baby gestates at an alarmingly fast rate, and Gabrielle gives birth to a daughter she names Hope. Gabrielle wants to believe in her child's innocence, but when the baby apparently strangles a soldier, Xena assumes that Hope is little more than a vessel for Dahak to enter the world. She tries to kill the baby, but Gabrielle takes the baby and runs away. When it becomes clear that she cannot outrun Xena, she eventually sets the child adrift in a basket on a river. Gabrielle then lies to Xena, claiming that she killed Hope. Continuity and logic are both missing in this episode. The battle between Caesar and Boadicea, initiated in THE DELIVERER (50/304), is not concluded here. Boadicea and her entire army vanish without even helping Xena and Gabrielle secure passage for their return voyage, let alone staying on hand to help defend them against bigoted locals. Despite her wishes for Hope to 'be good', Gabrielle sets the child adrift in a hostile wilderness, where any wandering miscreant could pick up the baby. It is possible the evil Banshees took in Hope, as they evidently worship the daughter of Dahak. Xena gives Solan a Stooges greeting in MATERNAL INSTINCTS. MATERNAL INSTINCTS (57/311) picks up again after three months. Hope simply appears without explanation, now seemingly a child of perhaps nine or ten. She frees Callisto from the lava pit where Xena had trapped her [ A NECESSARY EVIL (38/214)]. Hope then proceeds to murder Solan, Xena's son, and Kaleipus, the Centaur who had been the boy's caretaker. When Xena realizes that Gabrielle's lie is partly to blame for her son's death, she is infuriated, and two women part at the end of the episode without reconciling. The most disappointing aspect of this episode is Callisto's return as a goddess. Given the character's history to this point, the viewer might expect Xena to stand no chance against a psychopath who now possesses the powers of a god. Callisto acts appropriately god-like for most of the episode, reveling in her new abilities. At the end of the episode, however, she realizes that Xena's suffering will not end her own. Moreover, Callisto realizes she is going to have to live with her pain for eternity, because as a goddess, she cannot die. This revelation might have been a powerful turning point for Callisto, a plot device to explain her refusal to fight or torment Xena, even though she could kill her nemesis by simply raising a finger. But instead of allowing this, the writers instead chose to have Xena defeat Callisto in combat, and bury her beneath a rock pile - a ludicrous outcome, to say the least. Sadly, Callisto's revelation is not followed through in subsequent episodes, as she continues to fight both Hercules and Xena. It is not clear why Hope needs Callisto in this episode. Even if Hope needed a distraction, it is hard to imagine Callisto not wanting to kill Solan herself. Furthermore, Hope seems perfectly capable of causing mayhem on her own. (That Callisto appeared in Hercules and Xena episodes during the February and May sweeps periods can hardly be a coincidence). This musical episode serves as the resolution of the "rift" arc, which includes the Dahak stories. Dahak appears in the episode only as a stream of fire. His presence is notable mostly because Hope's birth caused the beginning of the rift between Xena and Gabrielle. The major weakness of THE BITTER SUITE (58/312) is that five stories' worth of lies, betrayal, and deception, which explode into murderous anger at the beginning of the episode, are neatly resolved in a couple of syrupy ballads. Given everything that had gone before it, this outcome could not have been more trite or forced. (For a detailed analysis of this episode, see my review in "Time Out of Mind: Alternate Realities in Hercules and Xena ", Whoosh! #24, September 1998. This two-part story is one of the most powerful and dramatic HTLJ episodes to date. Callisto successfully travels back in time and kills Alcmene, the mother of Hercules. Hercules is never born. As a result, Xena does not change her ways, and the viewer sees a vision of a world in which the Destroyer of Nations has run rampant. Through of lucky twist of fate, Iolaus is able to undo Alcmene's death and restore history to its original pattern. Despite the overall strength of the episode, there are jarring continuity breaks, again, most of them concerning Callisto. Hope, still alive despite being poisoned and burned in MATERNAL INSTINCTS (57/311), once again retrieves Callisto from beneath a rock pile and commands the goddess to do her bidding. Hope makes the dubious promise of ending Callisto's pain if the goddess will destroy Hercules. At the end of ARMAGEDDON NOW I (H72/413), Callisto has acquired a pendant full of Hind's blood, which she easily could have used to end her own life. However, she instead travels back through time at Hope's command and murders Alcmene. 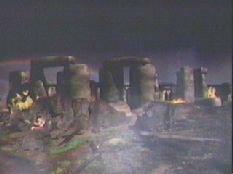 The goddess then goes forward to the time when Xena destroyed Cirra, Callisto's home village. Callisto could have killed Xena and her men, or killed her younger self, but she does neither. Despite her powers, Callisto cannot even persuade her family to flee the burning village, and she inadvertently murders both her parents while trying to save them. There are also continuity gaps in Callisto's family structure. Until this episode, Callisto had only mentioned her mother and sister. In ARMAGEDDON NOW (H72,73/413,414), she suddenly has a father, and her sister is nowhere to be seen. It is again unclear why Hope, who still retains her powers despite her badly burned condition, even needs Callisto to accomplish her dirty work. Hope seems powerful enough to achieve her own ends, and Callisto has never been anyone's fool, let alone their donkey. Dahak's dazzling disciples discreetly dance in SACRIFICE. This two-part episode marked the end of XWP's third season. Despite Xena's best efforts, Hope emerges from an apparent larval stage, now fully grown and an exact duplicate of her mother, Gabrielle. Hope sets about gathering innocents for a sacrifice that will bring Dahak into the world. She also conceives the first of six 'destroyers', fathered by Ares. Xena has hidden a dagger with Hind's blood on it (abandoned by Hercules and Iolaus at the end of ARMAGEDDON NOW [H73/414]), but she cannot use it to kill Hope without the Fates severing her lifeline. Xena is prepared to make the ultimate sacrifice to keep Dahak out of the world, but at the last moment, Gabrielle flings herself into a fiery abyss, taking Hope with her. Xena then uses the Hind's blood dagger to kill Callisto. This story suffers from an abundance of dropped details and baffling gaps in logic. First is the Hind's blood dagger. At the end of ARMAGEDDON NOW (H73/414), Hercules embeds the knife in a stone wall. When Hope shatters the wall to find the dagger, it is not there. It is never made clear whether Hercules removed the weapon and hid it elsewhere (presumably revealing the location only to Xena), or whether Xena retrieved the knife and hid it herself. In SACRIFICE (67,68/321,322), Xena sends Joxer to fetch the dagger from its new hiding place. However, this event is never seen on-screen, wasting potential for a nice moment of heroism on Joxer's part. When Joxer is captured and taken with other sacrificial victims to the temple, neither Hope nor Ares notices him despite the fact that he has been a friend of Xena and Gabrielle's for two years. Because they do not notice him, they do not realize he is hiding the Hind's blood dagger. Hope, in the guise of Gabrielle, even asks Joxer earlier in the episode if he knows the dagger's location. It is hard to believe she would later dismiss the possibility, however remote, that Xena might have trusted Joxer with such an important errand. Another unexplained detail is how Callisto frees herself from the vortex in which she had been imprisoned. In the process of escape, she loses the pendant full of Hind's blood. For this tenuous reason, she allies herself again with Hope, protecting Hope's cocoon and bringing her sacrifices. Callisto is evidently still foolish enough to believe that Hope can give her the peace or oblivion she so badly desires. When Hope refuses to kill Callisto, the goddess tries to join forces with Xena. Callisto offers to help the warrior kill Hope if Xena will then use the Hind's blood dagger to end Callisto's life. In a moment of unbelievable arrogance, Xena refuses Callisto's help and the opportunity to put an end to her foe, preferring instead that Callisto suffer for her small role in Solan's death! Evidently, it never occurs to Xena that eliminating Callisto might prevent the deaths of other innocents like her son. Callisto's demise at the end of the story seems like a tacked-on afterthought, an anticlimax unworthy of Xena's most wily adversary. Another unlikely detail in SACRIFICE (67,68/321,322) is established in an earlier episode. In FORGET ME NOT (63/317), the viewer learns that Gabrielle accepted the assistance of Ares to arrive in Chin ahead of Xena. While Ares certainly might be expected to cause dissension between the friends, it seems very out of character for Gabrielle, no matter how strongly she may wish to thwart the warrior's assassination attempt, to collude with Ares to accomplish that aim. Ares hassles Gabrielle in FORGET ME NOT. Furthermore, not a hint of Ares' machination is given in THE DEBT (52,53/307,307). This twist most likely was written at a later date to set the stage for Gabrielle's self-sacrifice in the season finale. In FORGET ME NOT (63/317), Ares warns Gabrielle that she owes him a favor. He collects this favor in SACRIFICE (67,68/321,322) by stipulating that if Xena kills Hope, the Fates will sever the warrior's lifeline. Incredibly, the Fates agree to this spurious exchange, which hardly constitutes Gabrielle repaying Ares for the boon he grants her in THE DEBT . Ares himself is handled very badly in this episode. All throughout the Dahak arc, Ares had been opposed to the demon-god, whom he seemed to view as a potential usurper of the Olympian deities. In ARMAGEDDON NOW (H72,73/413,414), he is clearly horrified by Hope, and outraged at Callisto's murder of his nephew Strife, under Hope's instigation. He refers to Dahak as the "one great evil" whose arrival all the gods of Olympus have sensed. Yet, in SACRIFICE (67,68/321,322), he switches loyalties with hardly an explanation (he briefly sees a flash of light, presumably Dahak), becomes the demon's lackey, and is used as a stud for the creation of Hope's destroyers. By the episode's end, Ares has barely a shred of dignity left. A more compelling story might have involved an uneasy alliance among Xena, Callisto, and Ares - even if the two gods wanted to defeat Hope for their own selfish reasons, such a collaboration would have provided an opportunity for much fascinating interplay. The writers, however, seem to have chosen a predictable formula: Ares and Callisto both ally themselves with Hope and Dahak. Xena looks that much more virtuous by contrast. As a result, every character in the episode is flattened, made either good or evil. Xena overcomes the collective power of three gods, almost completely on her own! There is very little dramatic tension in a story when a hero is rendered so all-powerful. Similarly, the entire Dahak arc might have been used to expand and develop all the recurring XWP characters. In the process of dealing with the threat of a faceless, omnipotent evil, each character might have gained something, lost something, learned something, grown, and changed. Unfortunately, only Gabrielle really changes, and that mostly involves her growing older, sadder, and wiser as a result of her experience. Xena becomes almost obnoxiously arrogant and self-righteous, Callisto becomes slow-witted and stupid, Ares is painted as a coward, turncoat, and sell-out, and Joxer has a single moment of heroism, the larger part of which is unseen. Rather than integrating Dahak into the larger universe of XWP, the writers warped the XWP characters to accommodate Dahak. Dahak becomes the tail that wags the dog of the entire third season. Unlike the three-headed dragon of Zoroastrianism, Dahak seems little more than a nebulous entity, who despite his purported power, needs an incredible effort (from Hope, Callisto, Ares, scores of fanatical followers, and several dozen sacrifices) to even manifest himself in the world. It is hard for the viewer to take such a menace seriously. And if Dahak continues to be a presence in the worlds of Hercules and Xena (both of which are slated to run for at least another two seasons), how are the writers going to deal with this supposedly ultimate evil when he is not needed? Will Dahak, like Callisto, be stashed under the nearest rock pile while the other characters are occupied elsewhere? In retrospect, it is difficult to see why Dahak was needed to accomplish a rift between Xena and Gabrielle. Episodes in seasons one and two often show the women at odds with each other in far less fantastic situations. One need only look at an episode like THE PRICE (44/220) to see that tense, life-and-death circumstances are more than adequate to cause discord between the friends. However, the writers and producers of XWP seem to have felt such a rift could only be caused by the Grand Guignol of the Dahak arc.